Shin splints refer to pain along the shin bone (tibia) from the knee down toward the ankle, this condition is sometimes called tibial stress syndrome. This is relatively common in active people especially runners. Symptoms of shin splints include aches or pain along the shin bone, it can be tender to touch with lumps and bumps along the bone. Treatment may involve rest, icing the area, improved training techniques. Persistent problems may require biomechanical correction with orthotic therapy. The posterior tibialis tendon runs on the inside of the ankle and under the arch and is one of the main supporting structures in the foot. If this tendon becomes overstretched or ruptures it may no longer be able to provide support to the foot and a flat foot deformity may result. 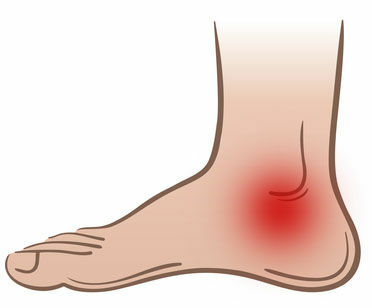 Symptoms include pain and swelling inside the ankle area which gets worse with activity. The most common treatment for this condition is orthotic therapy (shoe inserts). This will support the arch and allow the tendon to heal. This may be combined with anti inflammatory medication, cortisone injections or a cam walking boot. If symptoms persist for more than 6 months after treatment surgical reconstruction may be necessary. This is a relatively common condition in children and adolescents during times of rapid growth. It refers to irritation of the growth plate at the top of the tibia, just below the knee cap. Symptoms increase with activities that require strong muscular contractions of the quadriceps, such as going up and down stairs, running uphill, squatting. Treatment usually involves rest to allow the growth plate to heal with the appropriate stretching exercises. If your foot posture is a contributing factor then orthotics may also be beneficial. This term is used to describe Irritation and inflammation of the patello-femoral joint. Normally the patella (knee cap) sits in the centre of the knee joint so that forces are evenly distributed around the knee. When the knee cap moves out of alignment this can lead to pain just below the knee cap. During activity a sharp pain may be experienced below the knee cap that will develop to a dull ache afterwards. A clicking or grinding sound may also be heard when bending and straightening the knee. There may be various reasons for this condition to develop such as muscular imbalance (weak hip muscles, weak knee muscles, or tight quadriceps) and internal rotation of the knee. It is important to identify the correct reasons for the problem so a successful treatment program can be achieved. Treatment may involve rest, a strengthening stretching program or orthotics if the knee is twisting during activity. The Achilles tendon attaches the calf to the heel bone. This condition develops when the tendon becomes inflamed or irritated. 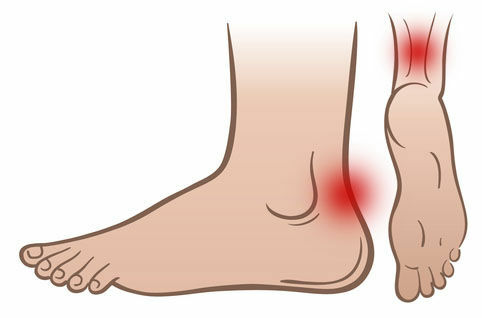 Symptoms vary from mild pain at the back of the heel to more severe cases where even standing or walking cause pain. This condition is common in runners as small tears develop in the tendon, other causes include poor foot wear, arthritis and over pronation. Early treatment can be simple and effective with rest and heel lifts. As the tendon degenerates orthotics, cortisone injections or even surgery may be useful. In the meantime, for further information, or to consult with one of our skilled podiatrists you can use the Contact Us buttons at the top or bottom of this page, call our Ettalong Beach practice on (02) 4344 4340, or visit Ettalong Podiatry‘s state of the art Podiatry clinic at 2/19-21 Broken Bay Road in Ettalong Beach.